LANSING — As Michigan prepares for a pivotal election in 2018, the state’s most active political action committees (PACs) are stocking up on campaign cash. 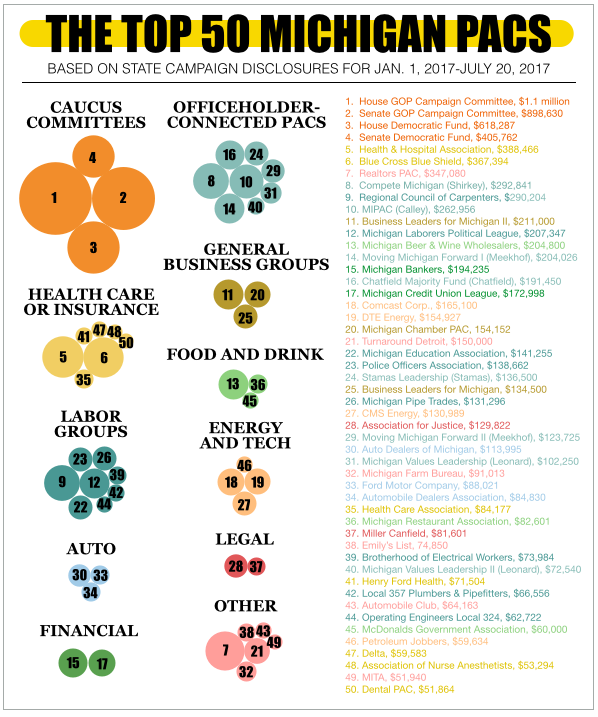 The top 150 PACs in Michigan have combined to raise $12.2 million so far in 2017, according to an analysis of new campaign finance disclosures. The total, which includes dollars raised as of July 20, is up about 11 percent over the same measure at the same point in the 2015-2016 election cycle. It’s the highest total posted by the top 150 PACs at this point in a two-year election cycle in at least a decade and could be the highest in state history, according to the Michigan Campaign Finance Network’s past tracking. Lawmakers, caucuses, businesses and a wide variety of interest groups use PACs to raise money that can be given to candidates or spent independently of the candidates on things like direct mail, radio or TV and online advertisements. As of July 20, 2017, the four most active fundraisers have been the committees of the four legislative caucuses: the House Republicans; the House Democrats; the Senate Republicans; and Senate Democrats. The caucuses raise money to support their members’ campaigns and spend it in the most competitive races across the state. In 2018, both the full House and the full Senate will be up for election. The four caucus committees have already raised $3.1 million in 2017, up from $2.4 million at the same point in the 2015-2016 election cycle. Each of the four caucus committees has raised more money this cycle than each did at the same point last cycle and at the same point in the 2013-2014 cycle, the last time Senate seats were up for election. The House Republican Campaign Committee, the committee of the House Republicans who control a majority of the state House seats, has raised the most money at $1.1 million. After the caucus committees, the PACs of three interest groups rank fifth, sixth and seventh in fundraising so far in 2017. The Michigan Health & Hospital Association’s Health PAC has raised $388,466. Blue Cross Blue Shield’s PAC has raised $367,394. And the Michigan Realtors’ PAC has raised $347,080. Each of those three PACs has raised more this cycle than it did last cycle. Those three PACs are traditional independent PACs that raise money from individuals and that give it to candidates’ campaigns. There are limits on how much PACs can give each candidate. They can give $68,000 to a candidate for governor, $20,000 to a candidate for the state Senate and $10,000 to a candidate for the state House. Other PACs known as Super PACs will play a large role in the 2018 election as well. Those PACs can raise money directly from corporations and can spend unlimited amounts in races as long as they do it independently of the candidates’ campaigns. As of July 20, there are nine PACs classified as Super PACs on the top 150-PAC list. The most active Super PACs have been the Business Leaders for Michigan’s Super PAC, which has raised $211,000, and Turnaround Detroit, which has raised $150,000. Turnaround Detroit has previously supported Detroit Mayor Mike Duggan, who is up for election this year. Turnaround Detroit reported receiving $150,000 from the Michigan Regional Council of Carpenters on June 6, but the Super PAC hadn’t reported any expenditures in 2017 as of July 20. The Business Leaders for Michigan’s Super PAC, which supports pro-business policies, has received 18 contributions of at least $10,000 so far this year. Of those, 16 came from businesses. Michael Jandernoa, former CEO of Perriogo, gave $20,000, and Doug DeVos, president of Amway, gave $10,000. More Super PACs, which can raise and spend large sums of money quickly, will appear on the top 150 list as the November 2018 election nears. The last time Michigan had a gubernatorial election, 32 Super PACs made the list of the top 150 PACs by the end of the election cycle. 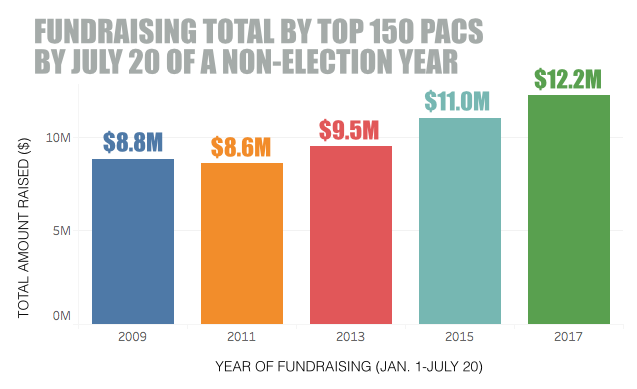 Of those, 20 were among the top 40 PACs in fundraising for the cycle. Next year, in addition to electing a new governor, Michigan voters will choose a new attorney general and a new secretary of state while also picking candidates to fill two seats on the Michigan Supreme Court and all 148 seats in the Michigan Legislature. A full list of the top 150 PACs at this point in the 2017-2018 election cycle is available at this link. The following are other notes from the top 150 list. — Twenty-nine PACs connected to individual officeholders — either current or past — made the list of the top 150 PACs. The most active leadership PAC has been Compete Michigan, which is connected to Sen. Mike Shirkey, a Republican from Clarklake, and has raised $292,841. Shirkey, who is said to be a candidate for Senate leader next session, can use the PAC to support candidates who support his leadership bid or to support the GOP caucus in general. Compete Michigan's top donors include John Kennedy, the CEO of Autocam, who gave $40,000, and Jon Cotton, president of Meridian Health, who gave $25,000. — Among the PACs making their first appearance on the top 150 list is MIPAC, a committee connected to Lt. Gov. Brian Calley, a Republican from Portland. The PAC has raised $262,956 and has been supporting the ballot proposal campaign to establish a part-time Legislature in Michigan. MIPAC received $100,000 from former MPI Research Chairman William Parfet on March 13. — Another new PAC to the list is Make Michigan Great, a Super PAC that has a similar name to President Donald Trump’s slogan “Make America Great.” Make Michigan Great launched in May. It’s already raised $41,007. All of the money came from the Michigan “Laborers Vacation Fund,” according to its disclosure. The Super PAC shares an address with the Michigan Laborers’ District Council, an affiliation of seven laborers’ local unions. — One PAC that isn’t on the new list is the United Auto Workers Voluntary PAC. Usually, the UAW V-PAC is a staple of the top 150 list but it’s only reported $90 in contributions so far this year. At the same point last cycle, the PAC had raised $102,032. But it’s low early fundraising total isn’t unusual. In the 2011-2012 cycle, the PAC had raised only $757 at the same point. 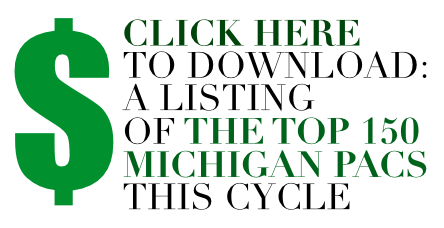 — Emily’s List Michigan is one of the PACs that has increased its fundraising this cycle. Emily’s List, a national organization that supports Democratic female candidates, is backing Democratic gubernatorial candidate Gretchen Whitmer, of East Lansing. The Michigan PAC has reported $74,850 in contributions and has given $66,000 to Whitmer’s campaign.